This season's peaches have been like the "Goldilocks and the Three Bears." July's peaches were too hard. August's peaches were too soft. September's peaches are just right. In fact, Southern California's September peaches are often plumpest, juiciest, prettiest peaches of all with appealing names like Summer Flame and Suncrest. After you've eaten your fill of peaches out-of-hand, baked into pies, slipped into cobblers, and mashed into jams, try some grilled and stuffed with mascarpone cheese and rosemary. They're deceptively simple to make and deceptively delicious. I should tell you that they taste best when eaten al fresco, with a loved one, while sipping a glass of chilled Sauvignon Blanc, and watching the sun set. 1. Slice the peaches in half and discard the pits. Brush the flesh with a little bit of olive oil. Heat a grill to medium or place a grill pan over medium-high heat on the stove top. Grill for 3 to 4 minutes or until the flesh begins to caramelize and light grill marks appear. 2. Meanwhile, in a small bowl, combine mascarpone cheese, lemon zest, lemon juice, rosemary, and salt and pepper. Stir until combined. Divide filling evenly among the four peach halves. Serve. Delicious, Susan! Looks like your peach story has a happily ever after ending! Those look delicious Susan - proof positive that less is more! Peaches here have been pretty good all summer, but you're definitely right that this latest batch has been the best! I love this simple preparation...this time of year, you don't need to do much to make them shine! These look absolutely delicious and right up my alley. Thanks for the heads up that peaches are "just right" in SoCal at the moment - I live in LA and will definitely be snagging some at the farmer's market this week based on your recommendation! These look delightful and perfect for my current grain-free diet. Thanks! kelly-I know what you mean. It wasn't as robust as previous years. lynne-That's what I like to hear! maia-Oh, I'm so happy to have helped. They always are the best this time of year, so enjoy! joanne-I'm glad you've enjoyed them all season. And it's true, they're shining all on their own! Susan, those look perfect. 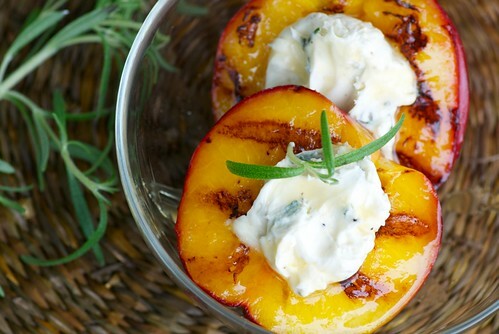 Hard to go wrong with peaches and cheese. If you are lucky enough to have peaches worth preserving for later, here's a quick method for making puree that freezes well. You won't be able to grill the peaches in December, but you can make a Bavarian, or ice cream, or a chiffon pie, or fruit leather...you get the idea. Halve and pit the peaches and place in a large pot with 1-2 tablespoons lemon juice. Cover, simmer until fruit is soft-about fifteen min. Put them through a food mill to get rid of skins (a food processor will mush them up too much and become watery). Cool, pack into freezer-safe jars leaving 1/2 inch headroom for expansion. It sounds like a lot of work, but we're talking maybe 30 minutes, tops. Your Goldilocks reference hit the nail on the head! We have been enjoying some wonderful peaches over the past couple of weeks. What a wonderful savory and sweet combination in this recipe. One of my culinary school chefs used to say we ate with our eyes. Looking at those peaches, I think he is right (I wrote about it here, if you like: "Culinary School: Three Semesters of Life, Learning, and Loss of Blood" - http://amzn.to/oqXw1R ). Oh this looks soooo good! Our peaches here are imported and never as good...will have to appease myself with that gorgeous photo! looks awsome, although I must say I am a little hesitant to mix fruit with savory items. Tomatoes being the exception of course. dara-Oh, thank you! I'm all about mixing sweet and savory flavors. cookingschool-Sounds like a neat blog. christy-30 lbs? Whoa! That's a LOTTA peaches. I hope you do make them as a starter, and I think I'll add your caramelized nuts next time too. Delicious! neil-I personally love savory fruit dishes, but I understand if you don't. If you like tomatoes, peaches aren't that much of a stretch in terms of flavor since both are mildly sweet. I hope you give it a try! Um...yes please?? What an amazing recipe - I can taste the killer combination already :) Yummmy! This is an excellent post. It contains great Ideas that help in cooking. Lovely desert for an afternoon tea or a dinner. I just love it.